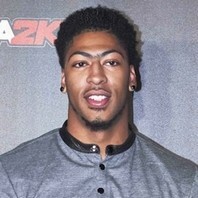 NBA power forward/center who was drafted first overall in 2012 by the New Orleans Hornets, who were renamed the Pelicans in 2013. He was selected to his first NBA All-Star game in 2014 and led the NBA in blocked shots in both 2014 and 2015. He spent one year at the University of Kentucky, earning the 2012 National Player of the Year award while leading his team to a 38-2 record and an NCAA Championship. I always tried so hard to fit in, and then I figured out that I didn't want to fit.